A homicide detective in a Virginia sheriff’s department is a “policymaker,” a federal judge has ruled, so the detective can be fired for opposing the sheriff’s reelection. 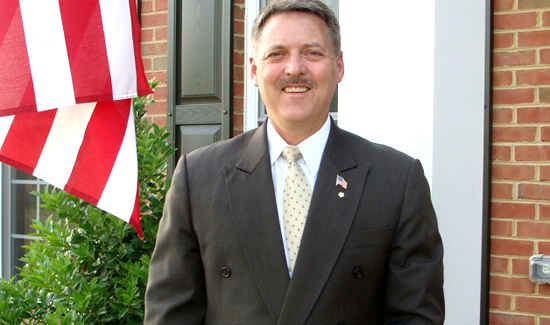 The decision not to rehire Mark F. McCaffrey, a police officer and sheriff’s deputy for 30 years, was made by Loudoun County, Va., Sheriff Mike Chapman (R) (pictured above), and it threatened to upend the high-profile murder trial of Braulio Castillo in 2016, as Chapman had suddenly ousted the lead detective. Had some misconduct by McCaffrey affected the case and prompted the sheriff to remove him on the eve of trial, defense attorneys wondered? No, Chapman acknowledged to the lawyers in the case. He refused to reappoint McCaffrey in 2016 because he supported Eric Noble, Chapman’s opponent in the 2015 Republican primary, and “not a work performance issue,” according to a prosecutor’s memo in the case. The Loudoun prosecutor’s office temporarily hired McCaffrey to work on the murder trial, which resulted in Castillo’s conviction for killing his wife and staging it to look like a suicide. In July, McCaffrey sued Chapman and Loudoun County alleging retaliation and a violation of his First Amendment right to free speech. Chapman responded in an affidavit that as an elected officer, “I have a right to not swear in any deputies or other sworn personnel at the beginning of my term,” and “I perceived Mr. McCaffrey’s conduct as a threat to my ability to lead and manage” the Loudoun sheriff’s office. He noted that McCaffrey had voiced complaints about Chapman to other deputies and to the Police Benevolent Association, which did not endorse Chapman in 2015. U.S. District Judge Anthony J. Trenga sided completely with Chapman and dismissed the case Thursday. McCaffrey’s attorney, Robert Cynkar, has already appealed to the U.S. Court of Appeals for the 4th Circuit. Want More Convictions & Safer Communities?